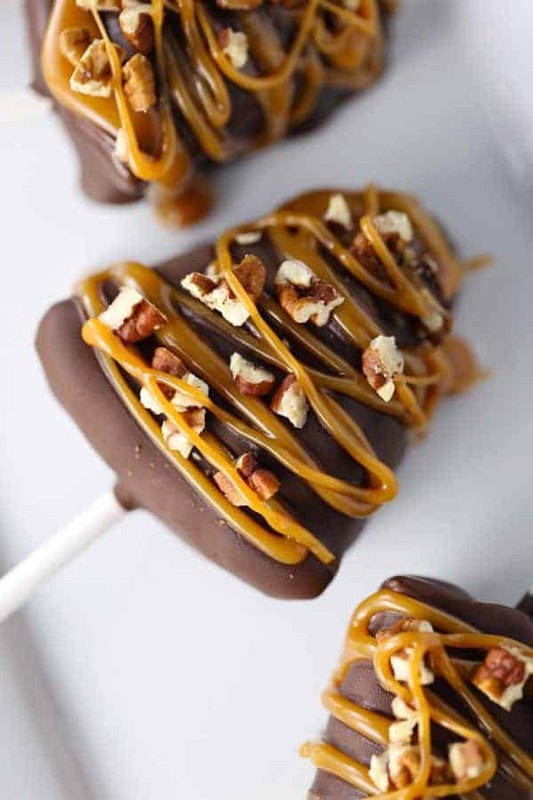 Chocolate Turtle Cheesecake Pops are pieces of cheesecake on a stick, dipped in chocolate and topped with caramel and pecans. 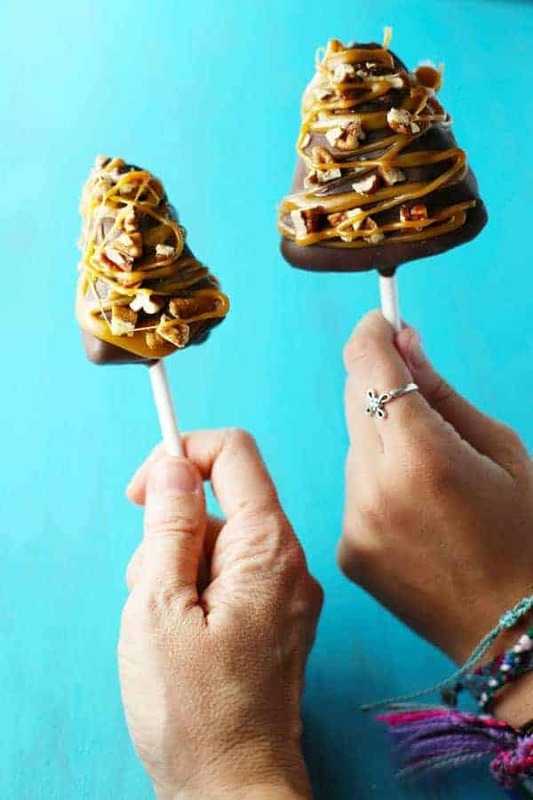 I recently saw a video on Facebook of a food truck in Toronto that serves cheesecake on a stick, dipped in chocolate. What a fabulous idea! I just had to try them, but Canada is a bit far from Atlanta. What’s a girl to do. I just had to try making them at home. The food truck used homemade cheesecake which I think would be amazing, but believe it or not, cheesecake is not my specialty. I find it a bit tricky, so using store bought cheesecake was just easier for me. Feel free to try this with homemade cheesecake! 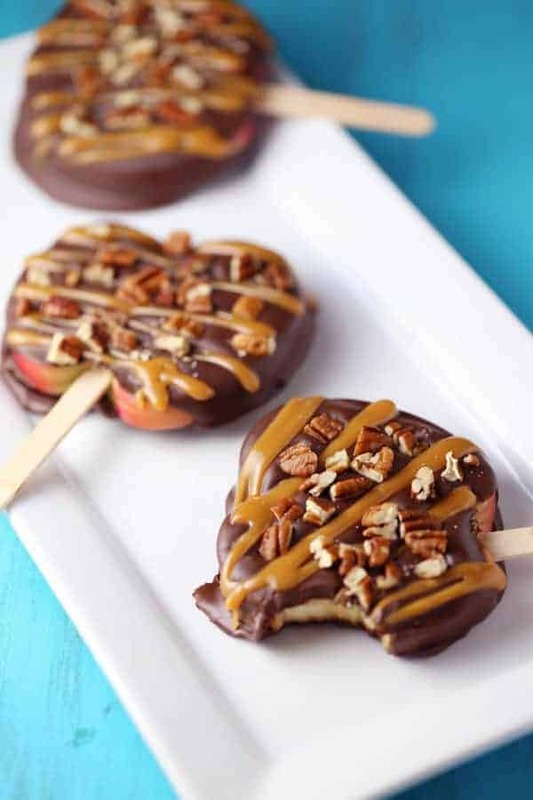 Before I get to the step-by-step instructions of these Chocolate Turtle Cheesecake Pops, can I just say something on a different subject? Moving is hard and absolutely no fun! I just had to get that off my chest. We are in the process of moving 2 miles away but never the less, we must pack up every single item in the house to transport it down the road. Meh! What a pain, right! It’s surprising I was able to make this recipe, take the photos and get this blog post up in the midst of all the chaos. I’ve also got another challenge coming soon. I will have no kitchen for 6 weeks! I repeat. I will have no kitchen for 6 weeks! Not sure how we will manage that. But the good news is that I will have a brand new, beautiful kitchen soon and I can’t wait to share it with you. 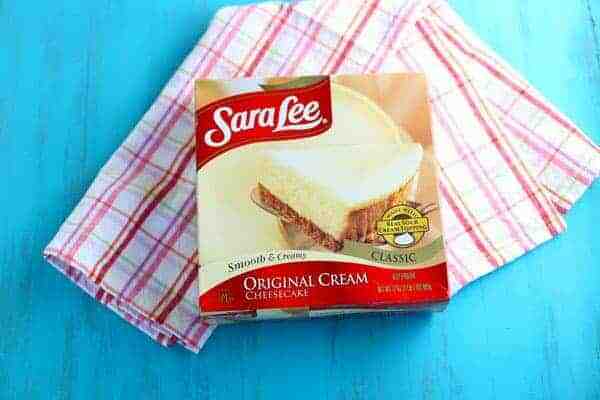 This is not a sponsored post for Sara Lee, it just happens to be the brand available at my local grocer. Pick your favorite kind and let it thaw a bit. Cut into 8 slices, then place a popsicle stick into the side of each slice. I put a strawberry slice on top, so it would look pretty in the photo but this is optional. Place slices in the freezer for 2 hours. Meanwhile melt chocolate chips with coconut oil in the microwave. You can use vegetable oil if you want to. Hold the frozen cheesecake slice over the bowl and spoon chocolate over the cheesecake until it’s completely covered. Place on a tray that’s been lined with wax paper. 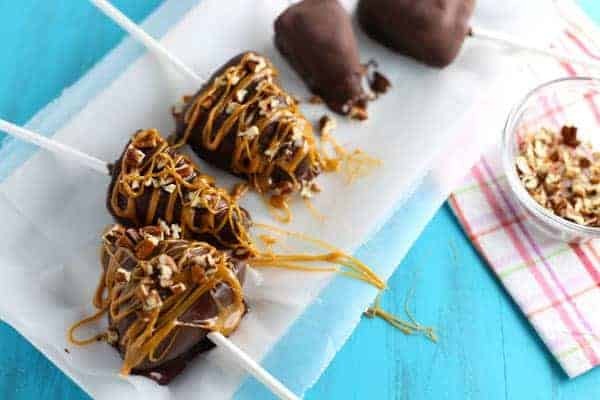 Melt caramels and cream in the microwave and drizzle over chocolate. Add chopped pecans. Do this one at a time as the caramel dries quickly. 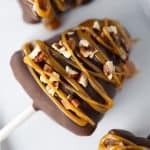 So drizzle one cheesecake pop with caramel and add the pecans right away, then repeat. 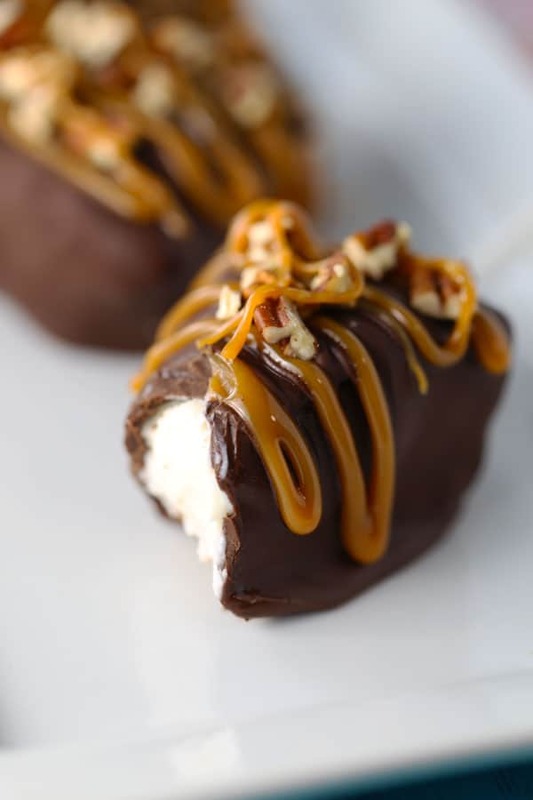 Chocolate turtle candies are my absolute favorite and even better when covering a piece of cheesecake. So satisfying! Because the cheesecake is frozen, once you spoon the chocolate on top, it sets almost right away. 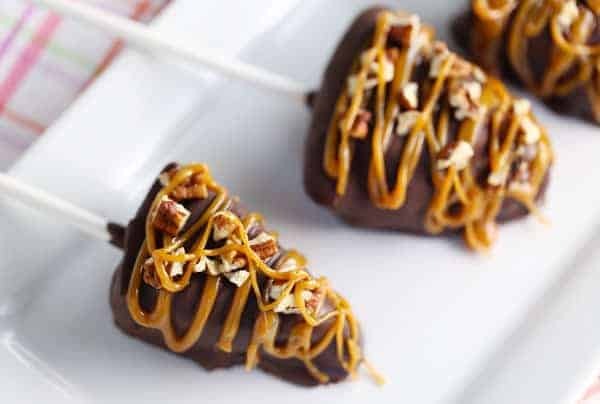 After you drizzle with caramel and add pecans, they are ready to serve. 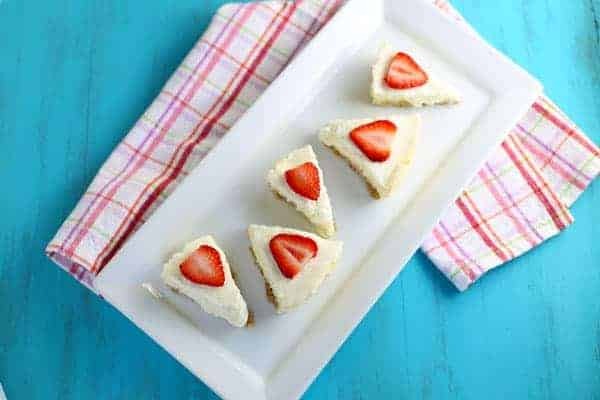 Cut cheesecake into 8 triangular slices. Place a popsicle stick in the side of each slice. Place slices with popsicle sticks in freezer for 2 hours. 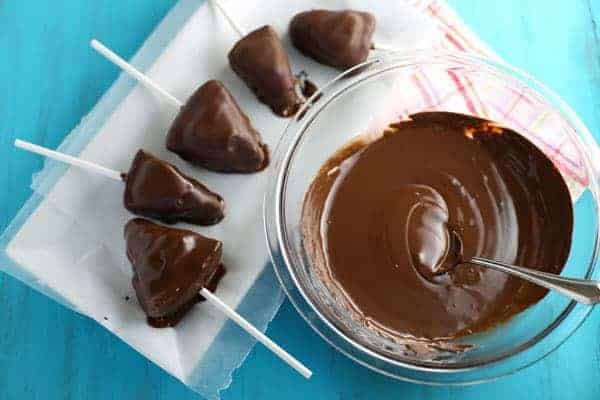 Place chocolate chips and oil in a microwave safe bowl. Microwave on high for 1 minute. Stir until completely melted. Microwave another 15-30 seconds, if needed. Take cheesecake slices out of freezer. Hold one at a time over bowl and spoon chocolate over cheesecake until completely covered. Place on a cookie sheet that's been lined with parchment or wax paper. Repeat for remaining slices. 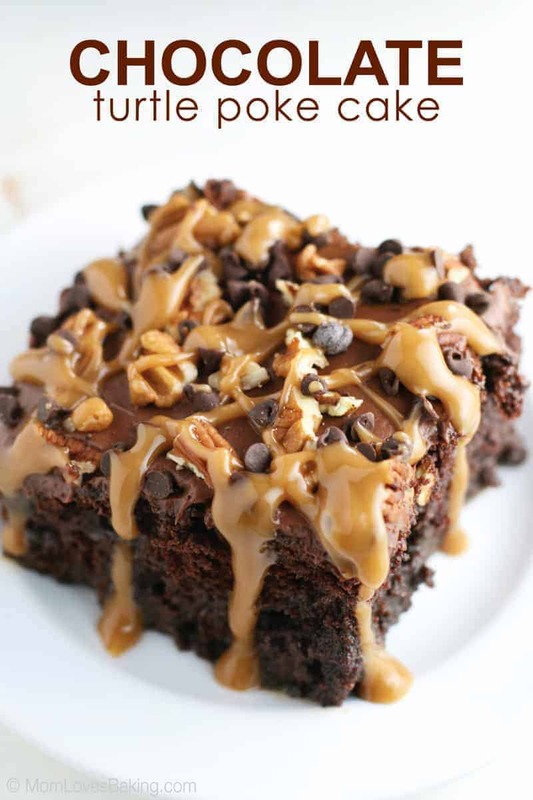 Drizzle caramel over chocolate and add pecans. 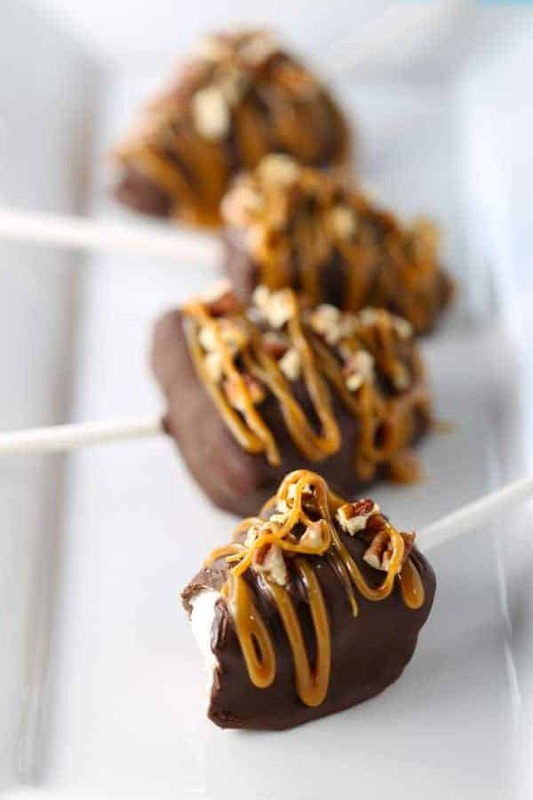 Do this one at a time because the caramel dries quickly. This post is featured on The Southern Plate Meal Plan Monday #72.